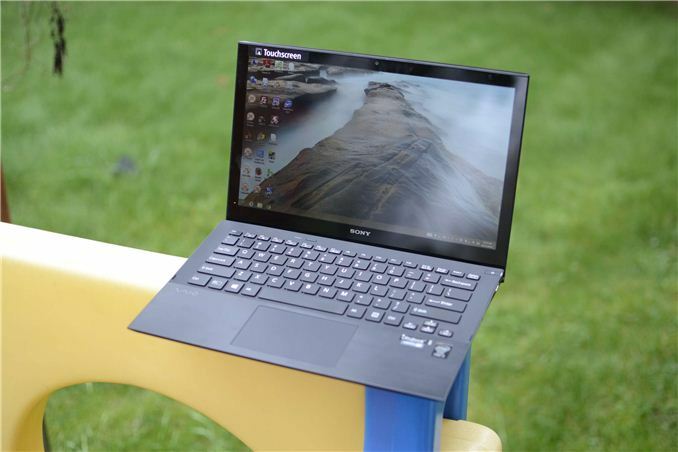 As our first non-Apple Haswell Ultrabook, the Sony VAIO Pro 13 has a high bar to clear. We’ve seen a few Haswell systems that have delivered on the promise of improved battery life, and in some cases we’ve even seen improved performance. The performance improvements mostly come in the form of faster iGPUs, at least for the GT3 and GT3e processors. Sadly, the GT3 and GT3e are only being used in a few products right now, which leaves us with GT2 mobile offerings. For these parts, Intel’s 4th Generation Core CPU line is more about reducing power use while keeping performance more or less the same. Sony has often been on the forefront of extremely portable laptops, and Anand has some great stories of $2000 laptops back in his college days that were terribly slow but delivered great mobility. Sony’s VAIO Pro 13 is the latest example of this, only now performance has reached the point where it's plenty fast for most users. Taking cues from Intel's targeting of mobility with Haswell, the VAIO Pro 13 isn't really any faster than last year's Ivy Bridge Ultrabooks – in fact, on the iGPU side of things the VAIO Pro 13 actually underperforms compared so some Ivy Bridge U-series CPUs. It appears Sony is focusing more of their efforts on managing thermals/noise than they are on squeezing every last bit of performance out of the processor. I don’t really fault them for taking such an approach, as the GT2 Haswell ULT solutions are generally going after providing acceptable performance in non-GPU workloads while delivering improved battery life. But we're jumping ahead. The CPU is Intel’s mainstream i5-4200U; that should deliver better CPU performance than the non-Turbo Core i3-4100U but it’s interesting to note however that Intel lists the same tray price of $287 on both CPUs (though that’s not what a large OEM like Sony would actually pay). There are quite a few Core i3/i5/i7 U-series processors of course, and many of them are more interesting than the i5-4200U. The i5-4250U gets GT3 graphics, with a tray price that’s $55 higher, and the i5-4258U and i5-4288U get GT3 along with a 28W TDP, which would really help with graphics potency. However, the VAIO Pro appears to be hitting some internal limits even with GT2, so without some tweaks to the firmware and/or other aspects the i5-4200U provides a reasonable starting point. One of the best aspects of the VAIO Pro 13 is the display, which continues the recent trend of Ultrabooks in going with a 1080p IPS panel, with 10-point capacitive multi-touch. Of course the speakers, ports, and chassis are all standard as well. Sony does skimp on the WiFi, going with Intel's Wireless-N 7260 solution, a dual-band 300Mbps chipset with Bluetooth 4.0 support (and let me just say that the marketing people at Intel that decided having Wireless-N 7260, Dual-Band Wireless-N 7260, and Wireless-AC 7260 as model names need a swift kick in the rear). Sony does have the option of getting the VAIO Pro 13 with Windows 8 Professional if you choose the configurable model, and you can also select Sony's Fresh Start option that skips all the VAIO utilities and other trial software – it's interesting that Sony recognizes that many businesses want that option, but they don't give consumers (or non-Professional users at least) the same chance. The only other areas you can configure your component choices are RAM, SSD storage, and the CPU...and this is where Sony starts to run into trouble. The base model has 4GB RAM and that’s a bit of a concern; it’s dual-channel memory, but 4GB is awfully small for a new laptop in 2013. The 128GB base SSD is also a bit small, but it’s a start at least; I’m just not sure about why that’s considered reasonable in 2013 on a laptop that starts at $1250. Interestingly, the SSD Sony uses is PCIe-based, and that means some of the fastest transfer rates for a single drive you're likely to see. Upgraded models can be configured with 8GB RAM, 256GB and even 512GB SSDs, but prices will jump quite a bit. It’s important to note however that the RAM is soldered onto the board, so whatever you get at purchase is what you’ll be stuck with, and I’d strongly recommend making the move to 8GB at this point. Getting to pricing, the base model that we’re reviewing has an MSRP of $1250 (there's also a configurable model that omits the touchscreen that starts at $1150), and that jumps to $1500 for the next model up (4GB RAM, 256GB SSD), then $1800 (i7-4500U, 8GB RAM, 256GB SSD), $2300 (i7-4500U, 8GB RAM, 512GB SSD), and even $2600 (the same as the $2300 model but decked out in red). The pricing from Sony’s online store is frankly a lot higher than I feel is warranted by the hardware – Sony is adding $250 extra for a $100 SSD upgrade, and another $300 for a $30 RAM upgrade and a $100 CPU upgrade. The good news is that MSRP isn’t always what you’ll pay; the Microsoft Store for instance has student discounts on some of the models that will drop the $1800 model to a more palatable (but still expensive) $1619. The $1250 model is also available at the Amazon Marketplace for $1230, but that’s hardly a significant savings. Hopefully if you’re interested in the VAIO Pro 13, you’ll be able to find one on sale. Bottom line then is that the VAIO Pro 13 is going to cost more than other laptops out there. The only question: is it worth it? Two months ago or so Sony had an awesome sale (presumably back to school) on this. I helped my friend pick out the Vaio Pro 13 with the 4200U, 8GB Ram, and a 256GB SSD for $1200 or so. I thought it was a pretty decent deal at the time, especially given the relative rarity of haswell ultrabooks at the time. The SSD upgrade was only $120 and I think RAM upgrade was about $50. I think we might have added the battery sheet at some point. Then of course her (rich and trying in every way to spoil her great daughter), against any advice I could muster, found the need to throw in a 512GB SSD (SEVEN HUNDRED dollar upgrade), the i7, and some other obnoxiously useless upgrades for a friend of mine who browses facebook and simply needed a nice laptop for class. End price ended up being about $2500. Yeah I bought just a bit ahead of that sale; I was super annoyed when I saw it. With that sale, the Vaio Pros were actually a bit cheaper than a lot of the higher-end Ivy ultrabooks available at the time. It was something like $50 off the RAM/CPU upgrades, $100 off the 256GB SSD upgrade, $50 off the sheet battery, and a $100 rebate to boot. "Modding" in that case essentially means they used a Thunderbolt/Lightpeak cable to connect to an externally housed GPU. Technically you could also do that with Firewire or USB but even USB3.0 bandwidth is so limited that you would be better off with the Intel graphics. Considering Sony's reputation for making short-life laptops it's hard to justify dishing out a months rent on something that will probably fail right after the warranty expires. Practically every VAIO I've ever come across beginning with the Transmetta Crusoe ultraportable's a decade ago have had chronic overheating problems, failed hard disks (from overheating) and terrible, terrible, terrible driver and warranty support.